Today a young Nelson Mandela would have been sent to Guantanamo, and rightfully so. First off, let me say that I have great respect for Mr. Mandela and how he spent his life after he got out of prison. But unlike the sychophants on the news and President Obama I will not deify him as the greatest human being ever or this fictionalized man of peace who never did wrong in his life. The fact of the matter is that for most of his life Nelson Mandela was a terrorist. Not a Muslim terrorist but rather a radical communist terrorist. So an equivalent of Guantanamo Bay is most likely where he would end up today. The world does not tolerate terrorists as much today as they did in Mandela’s youth. I’m willing to forgive the man for his communist leanings, he is free to have those, I mean Trotsky wasn’t as bad a guy compared to Stalin and that’s probably what got him killed by Stalin. But Mandela WAS a communist in 1962 when he published a booklet entitled, “How to be a Good Communist”. But it is the racial violence and acts of terrorism that Mandela supported in his youth that make me temper any adulation I give him now that he is gone. First of all, let’s straighten out the misconceptions of why Mandela was in jail. While the media loves to gloss over the real reasons and say it was simply because of his political beliefs that is just false. His political beliefs did get him brought up on quasi trumped up charges of treason, yet after a 4 year trial he was ACQUITTED in 1961. A few years later though, in 1964, he was charged and sentenced to starting an armed insurrection. As Americans, we fully appreciate the right to revolution, but if you lose, the government has the right to punish your failure. So the South African government sentenced him to life in prison. But before we start comparing Mandela to George Washington, the methods and targets of Mandela must be looked at. Mandela co-founded the Umkhonto we Sizwe (“Spear of the Nation”, abbreviated MK) in 1961, adopting the guerrilla tactics of Mao and Che Guevara . So Mandela forms the militant communist wing of the African National Congress that’s so radical even the United States acknowledges it as a terrorist organization. He was charged with 193 counts of terrorism: for sabotage and for trying to smuggle, prepare, or manufacture (mostly Soviet-bloc) munitions, including: 210,000 hand-grenades, 48,000 anti-personnel mines, 144 tons of ammonium- nitrate, 21.6 tons of aluminum powder, and 1,500 timing devices. During his incarceration Mandela still had a voice in the MK and chose not to dissuade the 1983 Church Street Bombing which killed 19 and injured over 200, many of which were women and children. 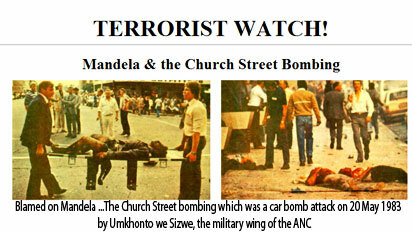 Throughout the 80’s Mandela’s Terrorist Group planted bombs and killed over 50 people and wounding over 400. These tallies do not include the figures of the tortures and summary executions perpetrated by the MK at ANC detention camps between 1979-1989 nor the deaths and injuries by the land mine campaign from 1985-1987. Now, one may rightly question whether Mandela was in fact complicit with these acts, if he actually approved of them. That is a fair question. The answer to it would be simple if Mandela condemned the actions of the MK. Especially when he became President of South Africa in 1994, one could rightly expect a man who disagreed with the MK’s methods to punish them in some way. He absorbed the MK into the South African Defense Force. In other words, he made the terrorists part of the army. That would be akin to, instead of killing Timothy McVeigh for the Oklahoma City Bombing, appointing him to the Joint Chiefs of Staff. So for the first 76 years of his life, Nelson Mandela was a terrorist and a communist. Then in 1994 he is elected President. He now had the power to realize his dream of killing all the white people. What? You didn’t know that was what the MK was founded for? Oh yeah, they even have a song about it that Mandela sang. Amu-bhulus translates to “a lot of boers”. Boers is the term for the white farmers who colonized South Africa and subsequently their decedents. So with Mandela’s group that he founded, whose theme song is about killing white people and after 30 years of terrorist bombings he folded into his official government, he now has the power to make it all come true. This is the point when he says “no”. It is here that he says there has been enough violence, enough racial hatred and enough killing. A lesser man may have let his bitterness over an extended incarceration, the apartheid and the oligharchy of the whites overwhelm him and let the the powder keg explode in a genocide against white people. But Mandela didn’t. He worked on reconciliation, ensuring that white South Africa would still have a safe place in the country. 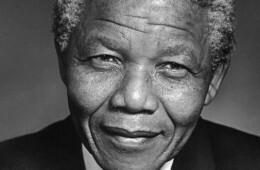 After he left office Mandela worked globally as an activist and a philanthropist. These are good things. Things that should be admired. They are made even more remarkable if you accept that fact that Mandela was a seriously flawed man in his youth who was a terrorist and complicit in the deaths of innocent people. When Mandela had power, he proved himself one wise enough to use it gently. Was Nelson Mandela a good man? For most of his life I would say no, but he was when it counted and that should count for something. With that being said, to compare him to Martin Luther King Jr. is an insult to Dr. King, a true “man of peace”. It was that comparison that I heard on cable news that inspired me to write this article. That also goes for Ghandi and others who were never terrorists but lived their lives well. Those who spoke against and condemned acts of violence for their cause. They are done a great disservice by having Mandela compared to them. Mandela’s last years may have redeemed him, but it does not erase the first 70.